Several species of venomous snake live in various habitats throughout Mississippi. All but one are members of the pit viper family, snakes characterized by triangular heads, heat-sensing pits near the nostril, elliptical pupils and stout bodies. Although bites from these snakes are rare and most bites are dry, you must seek immediate medical attention if you are bitten by one. 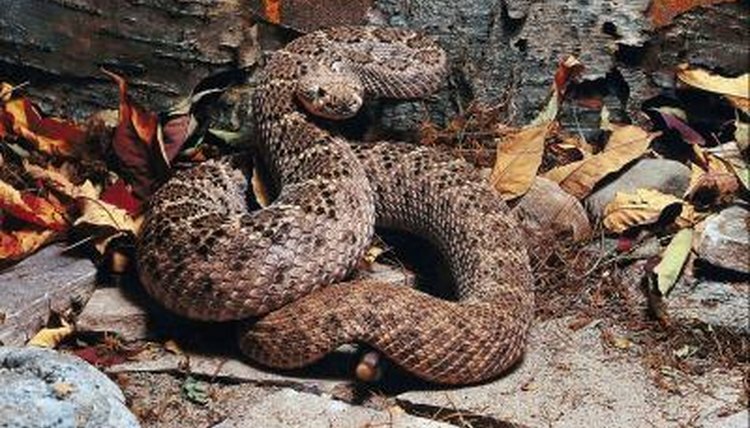 Mississippi is home to three species and various subspecies of rattlesnakes: eastern diamondback (Crotalus adamanteus), timber or canebrake rattlesnake (Crotalus horridus), and three subspecies of pigmy rattlesnake (Sistrurus miliarius). The eastern diamondback is the largest recognized rattlesnake, averaging length of 3 to 6 feet. The timber rattlesnake is also large, with average length of 2 1/2 to 5 feet. As its common name suggests, the pigmy rattlesnake is much smaller, reaching average mature lengths of just over 1 foot to just under 2 feet long. Each has the characteristic rattle at the tip of the tail, a formation of specialized scales that sound like a baby's rattle when shaken. The pigmy rattlesnake's rattle, however, is much smaller and seldom heard. The cottonmouth is aptly named due to the cottony-white lining of its mouth, which it so graciously displays when threatened. These snakes are commonly called water moccasins because of their semi-aquatic nature. Cottonmouths inhabit various wet and damp habitats but prefer floodplains, cypress swamps and wetlands thick with lush vegetation. Juveniles are boldly patterned and somewhat colorful; their patterns fade to almost solid as adults. Southern copperheads (Agkistrodon contortrix contortrix) also inhabit Mississippi. These snakes are almost pinkish in color with many dark, wide bands that resemble hourglasses. Like most other pit vipers, copperheads are stout-bodied with triangular heads. On average, these venomous snakes reach lengths of 2 to 3 feet, although they can reach 4 feet. Unlike rattlesnakes and cottonmouths, which have undeniable threat displays, copperheads do not give warning prior to striking -- although it is rare that they do so. The only venomous snake in Mississippi that is not a member of the pit viper family is the eastern coral snake (Micrurus fulvius). The coral snake has fixed fangs and belongs to the same family as cobras. These slender-bodied snakes typically reach lengths of around 2 feet. A vivid display of colors also sets this snake apart from the other venomous species and subspecies. Coral snakes have bright patterns of red, black and yellow. Sometimes confused with the nonvenomous scarlet king snake, a safe rhyme to separate these two similarly marked species is, "Red on yellow, kill a fellow; red on black, venom lack." This rhyme references the color pattern; the black and red bands of the coral snake are both outlined in yellow; the kingsnake's red areas are bordered by black. The coral snake also has a black nose, whereas the kingsnake's nose is red.